Built in 1872, like most other lighthouses Whaleback is automated and has been since 1963. It's definitely a photographers favorite. Conditions are constantly changing on the ocean and in the sky but it's a wide open view so you're almost always guaranteed a good shot no matter the weather, except fog of course. 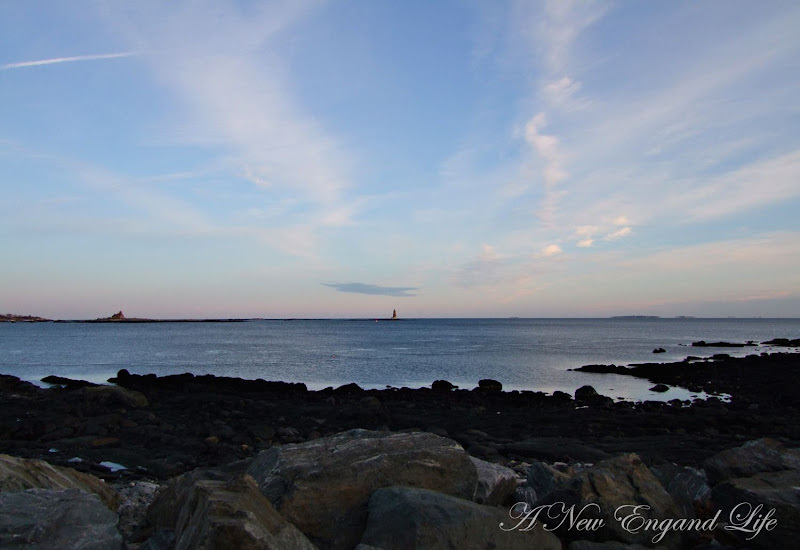 Though Whaleback can be seen from several vantage points in the seacoast area, on this particular day I happened to be at Great Island Commons (aka: New Castle Commons), the easiest and most accessible place to view Whaleback Lighthouse as well as Portsmouth Harbor Lighthouse. Both of these photos were taken during a sunset (behind me) on December 30, 2009, just a day before the full Blue Moon on New Years Eve. It was rather cold, and though you can't see it the moon sits in the sky just off to the left. Also located on the left hand side of the horizon is the historic and defunct Wood Island Lifesaving Station. Great Island Commons, and in and around New Castle remains one of my favorite places for photography. The views of the ocean, historic homes, and quaint yards are picturesque no matter what time of year. And that tiny one-horse-town post office of theirs is adorable! 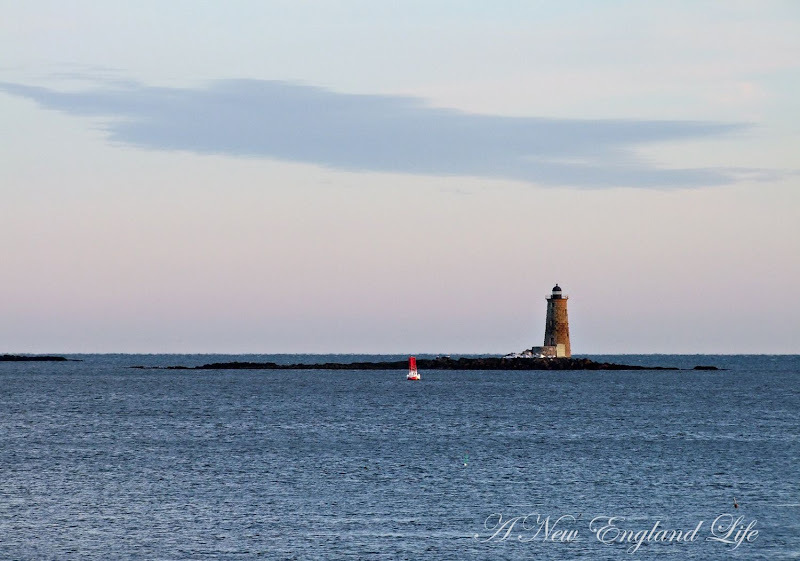 Excellent photos of Whaleback Light! Sharon and I like to visit the area around Kittery Point and love the food at Captain Simeons Restaurant. Great views of the light at Ft. Foster. The next time you and Sharon come down this way you should give me a heads up! I'd enjoy visiting with the two of you again. Love lighthouses. My first one was Cape Cod Light and then I started visiting as many as i could find. My favorites are Middle Bay Light in Mobile, AL, and Tibbits Point on Lake Ontario. This is a nice one and I can add this to my list of ones I can visit. Thanks! I always look forward to your awesome pictures and I especially love lighthouses. I absolutely love that second image. Nice composition. Between you and the History Channel, I learn a lot of geography, and I mean that in a good way. We will surely give you a heads up. We may be down during spring break next month, that is if the weather holds like it has here of late. I'm also a lighthouse lover, although I'm on the west coast. However, I loved East Coast lighthouses before I loved West Coast lighthouses. Great photos - I especially like the 2nd one. Oh these are so beautiful, Sharon! I love the wide open feeling and the gorgeous soft colors! Beautiful shots. I love lighthouses. Every time I see one I think about the men that called them home. What lonely lives they lived and how brave they were to be there by themselves when the ocean raged during a storm. The sky looks so spectacular in these photos, Sharon! Your photos make me feel I can walk right into them and immediately start enjoying all that beautiful scenery! Wouldn't it be cool if lighthouses could tell us the stories of things they've been a part of! I think this is beautiful. Keep safe in the snow. Wonderful photos, as always! It's always a pleasure to take a trip up the coast without leaving my computer room! What a very beautiful view Sharon. Both Pictures are beautiful Sharon.I love that wide open space. You are correct, the only constant is change. Love the shot. I love the cloud in the sky best of all! Beautiful New England shots. I think I need a daytrip up in your direction. I love the delicate sky colours in these photos! Lighthouses are such wonderful subjects!! Здравствуйте дорогие посетители mynewenglandlife.blogspot.com! Очень хороший ресурс в этом месте! Поизучайте эти переводные темы - некоторые трудились переводили тысячи текстов! What's not to love? Gorgeous.....just gorgeous!